Email Is Dead! Long Live Collaboration Tools! Email Is Dead (Not Yet)! Long Live Collaboration Tools! Imagine this: two employees located in separate offices have only an hour left to meet the deadline of a critical project. Instead of settling for the outdated approach of sending countless emails back-and-forth, they leverage the company’s communications and collaboration tools, such as audio conferencing and instant messaging, to conduct a much more effective conversation and strike a business deal in time. This is very much today’s reality, as people are simply not as attached to email as they used to be. In fact, one could argue we are witnessing the demise of the golden age of email. Just How Much Do We Email? To observe the ineffectiveness of email in today’s fast-paced business environment, consider the following numbers: employees check their email 36 times an hour, it takes 16 minutes for employees to refocus after checking email, and 2% of the workweek is spent managing email. In other words, a significant amount of time is wasted on housekeeping instead of production. It also appears that users are not as interested as they used to be with a new-fangled type of email. For instance, when Google attempted to revitalize email with Google Wave, users did not necessarily become more engaged by using the innovative system. Perhaps it was ahead of its time, or perhaps there were just too many features to ever allow it to be defined properly – part email, part Twitter, and part instant messaging. The introduction of Unified Communications tools has been the biggest driver of this, let’s call it, email disconnect. These tools have become so popular because of their inherit benefits, including faster communication and quicker resolutions to problems. More precisely, after migrating to collaboration software, there’s a 20% to 25% increase in productivity for knowledge workers, 77 percent gain quicker access to information and 60 percent of enterprises reduce communication costs. 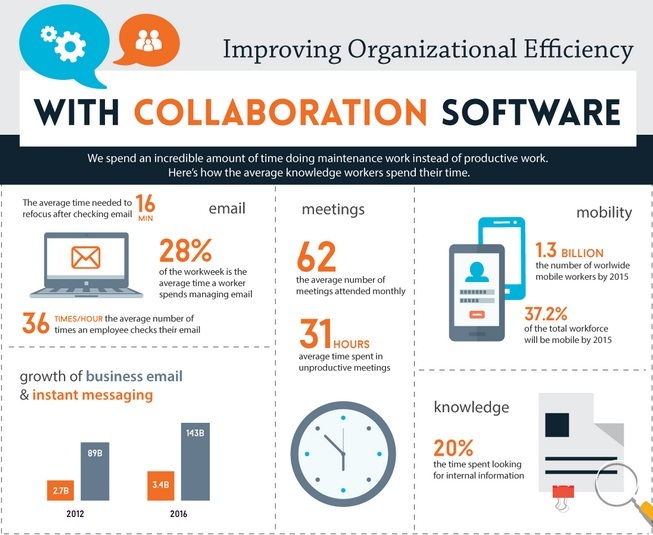 The statistics are overwhelmingly in favor of collaboration software as companies are adopting solutions to bolster productivity, streamline business processes, and encourage collaboration. Let’s take a look at why collaboration software is the wave of the future. Less dependence on email leads to saving extra time and that translates into more productive work. When companies adopt cutting-edge collaboration tools, employees can use their time more effectively and reach solutions expediently. For instance, instead of emailing back-and-forth to schedule a phone call, your employees can use presence technology to quickly locate and identify if their colleagues are available. For example, with VoipNow, presence would be the first thing to check before calling colleagues. Essential workday time will no longer be wasted on unproductive tasks. There is no disputing that the mobile workforce is becoming ubiquitous. In fact, 65% of companies allow employees to work remotely and 67% of employees feel they are more productive when working remotely. As such, it’s important for companies to equip their workers with Unified Communications software. Because it allows them to use instant messaging or rely on audio conferencing to handle more complex and time-consuming problems. As technology has advanced, social platforms have become more and more popular. By leveraging social technologies to bolster communication, companies can improve interaction amongst employees. For instance, social collaboration tools can connect workers in different parts of the company, often across the world, who have similar interests and are trying to solve similar technical problems. With more information and data out there on the Web, social collaboration networks are great for quickly sharing information that everyone needs to know. Interested in leaving email in the dust and migrating to a cutting-edge collaboration software solution to boost productivity and streamline business processes? Tell us your thoughts in the comments section below. – I also very oftne run mailing campains, sending newsletter or prospectus to my base of 4500 mail addresses. Thank you for your comment. I appreciate it. As with all things, there are benefits and downsides. Sure, email is still the core of business communication. And I think it will continue to be so for a while mainly because it is generally viewed as the most trustworthy of all communications tools. There are many UC channels or collaboration tools that cover the functionality of e-mail (including file sharing, large to unlimited storage capacity, etc) and easily manageable (without the need of an IT department), but people continue to stick to email for the reasons you mentioned and also because they tend to trust email more. My perception is that the information you get in an email seems more reliable than what gets transmitted through other channels. However, the forementioned alternatives are not to be ignored. The mobility and flexibility they offer is a solid counterpoint to email, which is a more static solution. Be that as it may, the number of users adopting UC/collaboration solutions is significantly growing. But then again, at the same time I believe are more prone to using different solutions for different channels, and thus remain reluctant to change. For the simple reason that they are comfortable with them as they are and don’t want to change them. They will continue to use a particular service for emailing, another service for instant messaging, etc.